Nutrisystem has been a trusted weight loss assistant for more than 4 decades. It is effective, budget-friendly, and incredibly easy to follow, which is why its popularity has never waned. Its customizable meal plans are not only designed to suit dieters with different nutritional requirements and preferences, they also manage to satisfy the differing needs of ladies and gents. In this article, we discover what this renowned weight loss meal delivery service has to offer to its female customers. Nutrisystem for women is designed to allow for gradual and steady weight loss. It is based on 3 major rules of healthy weight loss, including portion control, balanced nutrition, and frequent meals. The combination of these 3 rules has health-improving, metabolism-boosting effects and allows you to form better eating habits while shedding pounds. To make it easy for you to lose those extra pounds and inches, Nutrisystem for women does nearly all the work for you. It provides ready-made meals and teaches you how to cook and eat healthily on your own. It carefully crafts its plans so you get to eat every 2-3 hours, forget about constant cravings, and enjoy a well-balanced diet. It provides concrete and easy-to-understand guidelines and constant expert support, which can help you achieve maximum results. It allows you to stop wondering what you could do about your weight and let the experts plan, craft, and deliver your meals, so you can get slimmer without all the tedious work. Nutrisystem for women includes 4 standard plans for omnivorous dieters, including the Basic, Core, Uniquely Yours, and Uniquely Yours Plus plans. 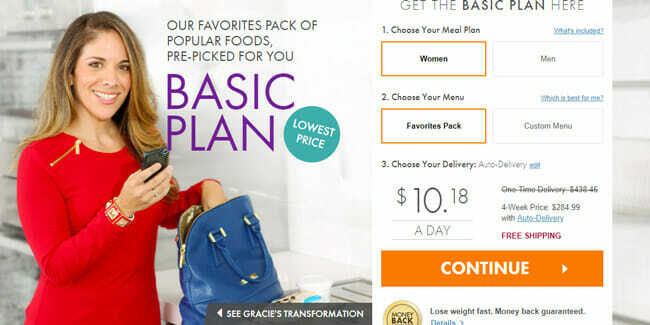 In addition to the standard plans, it offers the Vegetarian plan and diabetic-friendly versions of the Basic, Core, and Uniquely Yours plans. The Basic plan is the most budget-friendly plan. It lasts for 4 weeks and brings you 4 ready-made meals per day, including breakfast, lunch, dinner, and a snack. Apart from Nutrisystem meals, you get to enjoy 4 Flex meals per week. Flex meals are the meals you prepare on your own or eat at a restaurant following the Nutrisystem guidelines. You can decide on your own when you want to enjoy a Flex breakfast, lunch, dinner, and snack during the week. You can also decide whether you want to get pre-selected meals or choose the meals yourself. It should be noted that the selection of meals available with the Basic plan is limited in comparison to other plans. The price of the Basic plan for women starts at $10.18 per day. The Core plan features everything included in the Basic plan – 4 ready-made meals per day and 4 Flex meals per week for 4 weeks. However, it also allows you to choose from as many as 100+ items on the menu and includes unlimited support from weight loss consultants and dietitians and free weight loss tools and trackers that can help you monitor your progress and stick to the plan. The price of the Core plan for women starts at $11.07 per day. The Uniquely Yours plan provides everything included in the Core plan but offers greater menu variety. It allows you to choose from 150+ menu items and lets you freely mix and match frozen and fresh food items in your deliveries. The price of the Uniquely Yours plan for women starts at $12.50 per day. The Uniquely Yours Plus plan provides all the benefits included in the Uniquely Yours plan. The only difference lies in the fact that it also includes 4 weeks’ worth of Nutrisystem shakes (7 shakes per week). While you could purchase the shakes separately from the a la carte menu, it is important to know that with the Uniquely Yours Plus plan, you save almost 50% on your shakes in comparison to purchasing them individually. The price of the Uniquely Yours Plus plan for women starts at $13.93 per day. The Vegetarian plan can best be described as a meat-free version of the Core plan. It includes 4 meals per day and 4 Flex meals per week for 4 weeks and allows you to enjoy unlimited expert support and access to free weight loss tools and trackers. The only difference is that with the Vegetarian plan, you get to choose from 90+ dietitian-approved, vegetarian-friendly menu items. The price of the Vegetarian plan for women starts at $12.50 per day. The diabetic-friendly versions of the Basic, Core, and Uniquely Yours plans include all the benefits provided in the standard plans, but the meals you get to enjoy are rather different. These meals are created for dieters with Type 2 diabetes or at risk for Type 2 diabetes. Designed in accordance with the American Diabetes Association and American Heart Association guidelines for recommended sugar intake, they can help you lose weight, significantly lower your A1C, and easily keep your blood sugar and insulin levels in check. The price of the Basic-Diabetes plan for women starts at $10.18 per day, the Core-Diabetes plan for women starts at $11.07 per day, and the Uniquely Yours-Diabetes plan for women starts at $12.50 per day. With Nutrisystem for women, you get to eat about 1,200 calories per day. Your daily calorie intake may vary depending on your food choices regarding Flex meals. Nutrisystem for women meals generally contain no more than 300 calories per serving. As far as macronutrients are concerned, about 50% of the calories in Nutrisystem for women meals come from low-glycemic carbs, 25% of calories come from protein, and 20% of calories come from fat. All meals meet or exceed the standards set by the American government in the 2010 Dietary Guidelines for Americans. Furthermore, the meals contain no MSG, artificial sweeteners or trans fats. Does Nutrisystem For Women Work? The effectiveness of Nutrisystem for women has been proven in clinical trials. According to Nutrisystem experts, it is possible to lose up to 13 pounds and 7 inches during the first month on the program and clinical studies show that the average weight loss result for Nutrisystem dieters is 11.6 pounds and 8 inches. Thus, while individual results may vary, they are always noticeable and average at 1-2 pounds per week. If you are wondering whether you can lose weight simply by eating Nutrisystem meals, the answer is yes. However, the results are sure to be much greater if you follow the Nutrisystem recommendations and engage in moderately intense physical activity for at least 150 minutes per week. Nutrisystem diet for women combined with physical activity is sure to help you reach your weight goals more quickly than you expected. Nutrisystem for women is a weight loss meal delivery program that can help you lose weight without too much hassle. It provides meal plans for different dietary requirements and budgets, its effectiveness has been scientifically proven, and it yields amazing results when paired with moderate physical activity. On top of that, it is rather affordable, so you do not have to overstep your budget in order to lose weight with Nutrisystem for women.